Independent service shops and vehicle tuners require more information than what OBDII can provide to do their job effectively. Since the OBDII standard covers only emissions-related powertrain systems and sensors, there is a lot information you won't be able to see with a generic OBDII scan tool. With our enhanced interface options, you can get factory tool-like capabilities; allowing you to access hundreds of systems (ABS, airbags, instrument cluster, etc. ), sensors, and system/component-level bi-directional controls so you can do your job faster and with a greater degree of accuracy. Our support includes non-OBDII and European models. For example, due to their excessive vehicular weight trucks like the Ford Super Duty, Chevy Duramax, and Dodge are not required to be OBDII compliant. 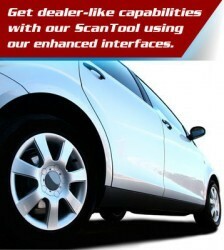 But with our enhanced interface options you can now access the diagnostics capabilities of these vehicles. For our European customers, our enhanced interface options also support Audi and VW, BMW, Chrysler/Dodge, Ford, Jaguar, Mercedes, and Toyota/Lexus diesel engines and the European-specific models. It's a powerful concept pioneered by AutoEnginuity that allows you to purchase enhanced options as you need them. Since enhanced interfaces are software-based updates1 for our ScanTool line that, once purchased, can be activated through email. There is no extra installation or special hardware necessary1. The enhanced interfaces come with free updates for the first 12 month period, and you can transfer your license to another PC if necessary. Another 12 months of updates the cost is 50.00 USD (Item #AC-Single) for one enhancement; 150.00 USD (Item #AC10-1) for up to three enhancements, or one region (Domestic, Asian, or European); 300.00 USD for 4 to 10 expansions (Item #AC10-2), or for a ProLine Bundle; and 450.00 USD for a ProLine bundle with any additional coverage (Item #AC10-3), per 12 month period. You are not required to purchase updates and can continue to operate the existing enhanced version for as long as you'd like. To keep our tools competitive against our factory scan tool competitors, we release an average of 4 updates per 12 month period.